Dusek: good morning, mr. Van Dam. Dusek: how old are you, sir? Van Dam: Brenda Van Dam. Dusek: how long have you been married to her? 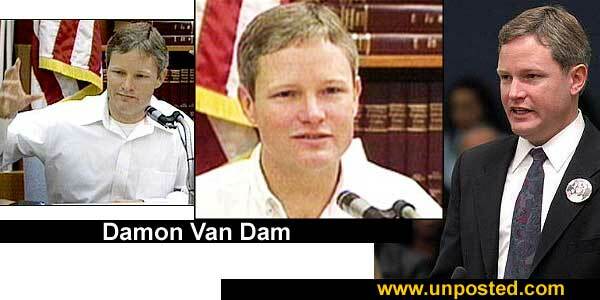 Van Dam: thirteen years? fourteen years now. Dusek: how long have you worked over there? Van Dam: most recently about a year. prior to that i worked there three years. Dusek: where do you live? Van Dam: 12011 Mountain Pass Road. Van Dam: Sabre Springs. between Poway and Scripps Poway Parkway. Dusek: is that in San Diego county? Van Dam: yes. in San Diego. Dusek: how long have you lived there? Van Dam: almost four years now. Dusek: do you remember when it was that you moved in? Van Dam: about this time four years ago. exactly i’m not sure. Dusek: who do you live there with? Van Dam: live there with my wife and three children. Dusek: who’s the oldest child? Dusek: how do you spell Derek? Van Dam: d-e-r-e-k. thank you. Dusek: we may have it wrong on some of our charts here. Van Dam: Derek is ten. Dusek: does he go to school? Van Dam: goes to school. Van Dam: he’s sixth. fourth grade. Dusek: what’s your next child? Van Dam: she was born september 26th, 1994. Dusek: how old would she be? Dusek: was she in school? Dusek: and your third child. Dusek: how old is he? Van Dam: he’s about to turn six. Dusek: what school do they — did they go to? Dusek: where is that in relation to your house? Van Dam: half-mile away. down at the bottom of the hill. on Springhurst. Dusek: let me show you a photo display board that we have had marked. it looks like neighborhood aerials we have it labeled. do you see what we have depicted here, mr. Van Dam? feldman: excuse me, your honor. for the record, is there an exhibit number? Dusek: do you have your bearings based upon the aerials? Dusek: can you locate your house on the top photograph, photograph a? Van Dam: yes. it’s marked v. d. already. that’s our house, the second one. past the intersection. Dusek: it has the v. d. on the roof? Dusek: also in photograph b do you see your house? Van Dam: this is our house. Dusek: with the v. d. on the roof? Dusek: and also photograph d, is that yours with the v. d.? Dusek: where is the school in relation to your house? Van Dam: you would have to come down this street. Van Dam: this is mountain pass. this is Springhurst. and you would have to go down Springhurst. it’s a big hill. and at the bottom of the hill right before Poway road is the school. Dusek: and you were indicating photograph a on exhibit 1 the street running top to bottom appears to be Mountain Pass. Dusek: and the street intersecting at the bottom of the photograph is springhurst? Dusek: were you still at the house when the kids would go to school? Van Dam: typically if I was i would take them to school, which was rarely. but typically i would have gone to work already when they went to school. Dusek: did you know how they got to school? Van Dam: usually Brenda would drive them. once in a while she would walk them. usually summer she would walk them. when it was cold out, she would drive them almost every day. Dusek: did you have a dog? Van Dam: what kind of dog? Dusek: how long have you had the dog? Van Dam: probably about eight months now. she’s just over a year old. Dusek: did you get her at what stage in her development? Van Dam: we got her I think around eight weeks. ten weeks maybe. still a puppy. Dusek: describe for us what a weimaraner looks like or is? Van Dam: like a pointer. like a short-haired pointer. about sixty pounds. about mid-thigh high. brown/gray color. Dusek: did the dog bark? Van Dam: the dog doesn’t typically bark. she’ll bark to get in the house, but other than that, she won’t bark. Dusek: you’ve lived in the neighborhood I think you say for almost four years. were you the first owner of your house? Dusek: did you come to know an individual by the name of David Westerfield? Van Dam: I didn’t know his name until after this. but i knew who he was. Dusek: so you didn’t know his name until these incidents arose? Dusek:do you see him in court today? Van Dam: yes, i do. Dusek: would you point him out, please, and describe what he’s wearing today? Van Dam: wearing a gray jacket, white shirt, and a tie. Dusek:did he live in your neighborhood? Van Dam: as indicated on the pictures in the house with the d. w. in each picture. Dusek: how far away is that from your house? Van Dam: close. right across the street. Dusek:there would be one house next to you, then you would have to cross the street to get to his corner house. Dusek: do you know the name of the street that you would have to cross to get to his? Van Dam: i keep bringing up dapple. that’s the street behind. Van Dam: Briarwood, Briarleaf, yeah. Dusek: and he’s on the same side of the street of mountain pass as you are, is that correct? Dusek: up until this situation, what contact did you have with mr. Westerfield? Van Dam When we first moved in, I was walking by one day. He had a sand rail in the garage. And we talked for a minute about his sand rail. Van Dam: dune buggy-type thing for going out in the sand in the desert. we talked for a minute about that. he had mentioned he went out in the desert. and that was about it. Dusek: did he give you his name or did you remember his name? Van Dam: he may have, but I don’t remember. it was a long time ago. Van Dam: since then what i remember is six to eight months ago, maybe a little more, he had had a pile of rocks in front of his house, and a car had apparently hit them and scattered them across the intersection. and he was cleaning the rocks up from the corner, from our corner. I think it will make it real clear, the rocks were out here (indicating). Dusek: near the front of his house? Van Dam: the front of his house near the fire hydrant. the car hit them and they had scattered all the way over to this corner. Dusek: towards the opposite side of Briarleaf? Van Dam: right. and he was over here shoveling them up into a wheelbarrow i believe. i went out and talked to him about what had happened. he said a car apparently hit them during the night, and he had to clear them up. Dusek: where you were referring to was exhibit 1, photograph c, is that correct? Dusek: and he was on your side of that intersection, cleaning up the rocks? Dusek: did you help him? Van Dam: no. just talked to him about it. Dusek: do you recall any other contact with mr. Westerfield? Van Dam: not speaking. just driving by. that was typically our way out, so we would drive by. and if we saw him outside, we would wave. Dusek: so you have to drive by his house to get out of your neighborhood? Dusek: did you do that to other neighbors in your neighborhood? Dusek: anything unusual about the hi and ‘bye with him as you were coming and going? Dusek: did you socialize with him? Dusek: had you ever been in his home? Dusek: how about in his backyard? Dusek: how about his garage? Van Dam: when i first talked to him that first time, I was at the threshold of his garage. i may have gone in to look at the sand rail, but I don’t think so. i’m not sure. Van Dam: that was when we first moved in. years ago. Dusek: had he ever been in your house to your knowledge? Van Dam: no. I had never seen him on our side of the street other than the time getting rocks as a matter of fact. Dusek: were you aware of any vehicles he owned or possessed during a time that he was living in your neighborhood? Van Dam: when he had that sand rail, i believe he had a baja-type bug which is a volkswagen with the engine exposed and, you know, engine exposed and exhaust comes out the back. and it was blue and had the cut-off fenders. and I think he had an older porsche carrera I think it was. and he had a winnebago, big camper with a trailer. Dusek: when you talk about a trailer, what do you mean by that? Van Dam: an enclosed I think it was white, an enclosed, put the sand rail in the trailer. Dusek: did that attract your attention? Van Dam: i noticed it. Dusek: did you ever speak about it with any of your neighbors? Van Dam: i spoke with Rich Brady. Dusek: is he a neighbor? Van Dam: yeah. he lives — he doesn’t live right in this area, but it’s around on another street. Dusek: how did you know mr. Westerfield, the defendant, had a winnebago? Van Dam: it was parked out there often. Rich had complained about it being parked there too often. and that it was — that there was some limit on the restrictions to living there. i noticed that. I didn’t know what the restrictions were. I know some of the neighbors were bothered about it. but. . .
Dusek: how long ago was this that you spoke with Rich Brady about it? Van Dam: around eight months ago, a year ago. Dusek. Did they have other kids in the neighborhood who they played with? Van Dam: Yes, their friend’s house is directly across the street. Dusek: mr. Van Dam, i’d like to ask you about rules you had for the kids where they could play and what they could do in the neighborhood. Did you have such rules for your three children? Dusek: were they the same for each of the three? Dusek: how far were they allowed to wander, if at all? Van Dam: on the sidewalk up the hill, they couldn’t go across the street. Van Dam: The — it’s the hill this way from the house. it doesn’t really show on any of these pictures. this hill goes up at a pretty steep angle, and the houses stop after a ways, and they had to stay on the sidewalk on our side, and they could only go up a little ways up the hill. Dusek: and you’re indicating on exhibit 1 photograph “a”, it looks like the hill you’re talking about is, as you proceed down Mountain Pass Road, it would be past the defendant’s house, past your house and continuing on? Van Dam: . yes, yes. Dusek: were they allowed to cross mountain pass to get to the other side of the street? Van Dam: no. they weren’t allowed to cross either street. when we moved in they were still building houses at the top of that street so there was a lot of traffic, so very early on we were strict about them not crossing the street. Dusek: and to get on the other side of the street was there a way for them to to do it with parent approval? Van Dam: yeah, they can come ask, like if they lost a ball on the other side of the street, or they would go play — their friend’s house was straight across. they’d come and ask and we would make sure they looked both ways. we were usually out there. Brenda or I was usually out there when they were out playing in the street anyway. Dusek: did they have other kids in the neighborhood who they played with? Dusek: basically where did they live? Van Dam: the most common was Ryan and Christie. the house, again now, none of the pictures show it very well, but the house directly across the street. our house is here. Ryan and Christie’s house is here. Dusek: on the opposite side of mountain pass? Van Dam: on the opposite side directly in front of our house. Dusek: did they have any bikes, skateboards, roller skates that they would play with? Dusek: where would they play with those? Van Dam: in our driveway, up and down the sidewalk in front of our house and sometimes, if they were allowed to — if they were playing over at Ryan and Christie’s, they would play in that sidewalk and in that driveway. Dusek: Ryan and Christie’s last name is what? Van Dam: Hennes. Julie’s children. Dusek: now, mr. Van Dam, i’d like to ask you about the last weekend, february 1st and february 2nd of this year. was that a friday? Van Dam: Friday — february 1st was a friday, i believe. Dusek: did you go to work that day? Dusek: where is your work located? Van Dam: it’s in Sorrento Valley down Mira Mesa, into Mira Mesa. Dusek: had you made any plans for that weekend? Van Dam: original plan, it’s kind of foggy because it was so long ago now, but i believe our original plans, we have a friend who has a cabin in Big Bear, and I was gonna leave work early and come home and get Derek, my oldest son, and we were going to go up and stay at the cabin for the night, and then go snow boarding saturday to Big Bear. Van Dam: just me and him. Dusek: Was there anybody you were going to go with? whose cabin? Van Dam: I don’t think. It might have been Bill Libby but I think it was just me and him in the original plans. What happened was, it was Bill’s cabin and his — he and his son wanted to go on sunday, so we changed those plans to go with Bill and his son Derrick on sunday instead of going just me and my son Derek on saturday. Dusek: So you were going to go up there Friday night and snow board on saturday? Van Dam: the original plans with that. Dusek: Then they got changed somehow? Van Dam: Then they got changed because Bill decided he was gonna go up that weekend. He said he wasn’t going to use the cabin that weekend at all, and his son decided he wanted to go up on sunday. To snow board on sunday. go up saturday, stay saturday night and snow board early sunday. Dusek: So when they made those changes, how did that affect your plans? Van Dam: I decided to stay home on Friday night and wait and go with them. Dusek: are you able to tell us when those plans changed for you? Van Dam: the day I can’t be sure. I think it was before friday. wednesday or thursday, but i really don’t know for sure. Dusek: so when you came home Friday you did not expect to go to Big Bear that evening? Dusek: is there a time for you to quit work, a regular time where you quit? Van Dam: . usually around 5:00. Dusek: do you consider yourself on the clock, so once it’s 5 o’clock you leave or just when you finish whatever? Van Dam: when you finish is how work is. Dusek: do you wear a watch? Dusek: when you drove home that Friday night, did you have any contact with family members? Van Dam: on the way home I think i called Brenda. Van Dam: I don’t remember who called who but i talked to her on the phone. Dusek: was there any discussion between the two of you? Van Dam: she was going out for pizza. she asked where I was ’cause she wanted to know if she could go out for pizza, and i was coming over the hill at Miramar, which is five minutes, less than five minutes from home. Dusek: so what did you discuss? Van Dam: she was gonna go out for pizza since i would be home so soon. Dusek: what did you have? Dusek: did you drink anything? Van Dam: had two beers with dinner, with pizza. Dusek: where do you keep the beers? Van Dam: there’s a refrigerator in the garage. we have a picture of where it is, right by the door out to the garage. Dusek: now, you mentioned that you went to the garage to get a beer or two, is that right? Van Dam: Yes. got one beer, had some pizza, got another beer a little later, had more pizza with it. Dusek: thank you, sir. who all did you eat dinner with? Van Dam: our kids, my wife and i and the children. Dusek: Do you know if your wife had any plans for that evening? Van Dam: yes, she did. Dusek: what were her plans? Van Dam: she was going to go to Dad’s cafe with a couple of her friends. Dusek: where is Dad’s? Van Dam: Dad’s is in poway on Poway road. Dusek: do you know how far it is from your place? Van Dam: I think we drove down there and it’s 2.3 miles from our house. Dusek: did i ask you to clock it? Van Dam: yes, you did. it took — distance or time wise, too? Van Dam: distance was 2.3 miles, and the time it took was four minutes in both directions, middle of the day with medium 5 traffic. Dusek: so it would take four minutes to get there and four minutes to get back? Dusek: who was she going with? Dusek: where did they live? Van Dam: Tierra Santa area. Dusek: do you know how closely they lived to each other? Van Dam: At the time right next door to each other. Dusek: what were your responsibilities while they were going to Dad’s? Van Dam: I was going to stay home with the kids. Dusek: where was she doing that? Van Dam: at the kitchen table at the beginning and — at the beginning the kitchen table, and later she moved to the chair in the family room. should i show you again? Dusek: do you see it on one of the exhibits? Van Dam: She moved to — she was sitting here at the kitchen table, and we were sitting here playing, and then she moved to this chair. and I don’t know if it’s — on some of the pictures that is. these three white areas in this exhibit are holes in the wall, so it’s right viewable from where we were. Dusek: you’re referring to the floor plan on exhibit 16 . if we could use, to translate where you said she was initially working, let’s use the photographs, if we could, on exhibit 17. where was she originally? Van Dam: actually these are still, too. this was real soon after. she was sitting here reading and writing and we were sitting here on this sofa. Dusek: i hear you’re referring to court exhibit 17 photograph “b”, she was sitting at the wooden chair to the left side of the photograph? Dusek: and the material on the table appeared to be what? Van Dam: appears to be her journal . Dusek: and then you indicated later she was sitting on the sofa behind the table? Van Dam: there’s a hole in the wall and there’s a chair. i think it’s in one of the pictures. Dusek: so that would be in the living room area? Van Dam: yes. I think it might be beneath this one. Dusek: do you see the location where she moved to in exhibit ? Van Dam: This chair right here. Dusek: and photograph “i” appears to be the brown high back chair? Van Dam: Yes. and these are the holes in the walls and here’s the sofa in the other room. we were sitting on it. Dusek: the holes in the wall between the living room and the family room, are there any screens or windows there? Dusek: it’s just an open area? Dusek: at some point that evening did your wife’s two friends show up? Dusek: were you keeping track of what time it was? Dusek: did you check a watch or a clock or anything? Van Dam: No. i may have looked at the clock but I don’t remember the time. Dusek: can you approximate or not? Dusek: what else happened that you remember? Van Dam: Brenda came down, talked to them for a while and then they went out to the garage. Dusek: who all went out? Van Dam: Brenda and Barbara and Denise. Dusek: did you go out when they first went out? Dusek: did you eventually join them? Van Dam: Yes, after a while, some stopping point in the video game , i went out and talked to them for a minute. Dusek: where in the garage were they, sir? Van Dam: In the floor plan here, the workbench here. Dusek: here by the workbench that is going side to side in the garage? Dusek: as opposed to the workbench that’s going top — is that visible in the photographs in exhibit ? Van Dam: You’ve got the side of it here. they were more on the side of — you can’t see it in this photo, though. Dusek: it would be off to the left-hand side of photograph 5 “b”? Dusek: What were they doing? Van Dam: They were smoking cigarettes, smoking marijuana and drinking. I don’t know if they were drinking beer or soda. Dusek: Do you know who was drinking the beer? Dusek: . Who was smoking the marijuana? Van Dam: I believe they all were. Van Dam: I smoked some of the marijuana. I think i took a puff or two of it. — Dusek: Did the police eventually asked you about whether or not you used marijuana that night? Van Dam: . Yes, they did. Dusek: They asked at one of the initial interviews of you? Van Dam: . When they specifically asked, I initially said no, and they then said that that didn’t matter, that they were more interested in finding Danielle, and I immediately responded yes, that we had. Dusek: So when they first asked you if you had smoked marijuana what did you say? Dusek: You lied to them? Van Dam: I didn’t think it mattered and I didn’t want to get in trouble for that. Dusek: How long were you out there, estimate? Van Dam: A minute, maybe a little longer. I know i went in because I had socks and shorts and a t-shirt on and it was really cold that night. the garage was really cold, so I didn’t want to stay out there. Dusek: When you left the garage where did you go? Van Dam: Back in to play video games with the boys. Dusek: Family room or living room? Dusek: what is the next thing that happens, as you recall? Van Dam: the girls came back in, said goodbye. I think i got up from the video games again and said goodbye at the front door to them. they left and i went back to video games with the boys. Dusek: are you able to estimate for us either how long they were there or about what time they left the house? Van Dam: Sometime around 8:00, a little after 8:00 they left I think . Van Dam: No, i couldn’t tell you for sure how long. Dusek: do you recall if it was light or dark out? Van Dam: I think it was dark but i’m not positive. Dusek: After the three ladies left, what did you do after that? Van Dam: Back to the video games . I think at that point I got another slice of pizza, another beer and shared that with my son, Dylan, the youngest, and then got another slice of pizza and shared that with him. Dusek: Shared the pizza, not the beer? Van Dam: Shared the pizza, not the beer. Dusek: Do they have a different bedtime on a school night or a Friday and weekend night? Van Dam: . yes. on school nights they go to bed at 8 o’clock. We put them down. they start reading and they usually end up going to bed about 8:30, because we read with them for a while. On Friday and saturday night, it just depends on if they have something the next morning or not. Ten o’clock is usually the latest. Van Dam: . they all — they all usually go to bed about the same time. Derek will actually read a little later. He’ll be in bed, though. Dusek: Why did you leave the doors cracked? Van Dam: I was going to watch tv, so I didn’t want to leave them open all the way because the noise from the tv, so I cracked them all six to eight inches, I guess. Dusek: Did they have any night lights in their room? Van Dam: They all have night lights but that night — Derek’s is an auto on, I think , that when the room goes dark the night light comes on by itself and — but I left Derek in his room with his light on. Van Dam: The big light, yeah, because he was reading. and then Dylan’s was on that night and Danielle’s was burned out that night, so i opened the blinds for the front street. She’s got corner windows, and i opened the binds so there’s streetlight shining for like in the room..
Dusek: And then there was a mess that the dog had made, is that right? Van Dam: The dog had pulled the doggie bed out and there was stuffing in the bed that was visible in photograph “a” on the floor. Dusek: And you cleaned that up somehow? Van Dam: Yeah. I cleaned that up, took it downstairs. Dusek: Then what did you do with the dog? Van Dam: I put the bed in the laundry room and took the dog to the back sliding glass door, opened it and let her out to go to the bathroom, closed the door while I was waiting, ’cause it was cold outside, and when i — i watched her and when she was done I let her back in. Dusek: Then what did you do? Van Dam: Laid down on the love seat in the family room and watched tv some more. Dusek: Do you remember what you watched? Van Dam: No. I was just channel surfing around. Dusek: How long would you estimate you remained down there? Van Dam: Twenty minutes, a half hour maybe. Dusek: And where did you go? Van Dam: Went upstairs to my bedroom and got in bed. Dusek: Did you do anything while you were up there? Van Dam: I brought the dog up with me and closed the dog in the room, got in bed, turned on the tv, watched tv for a little while longer. I’m pretty sure that i went to sleep because I don’t remember watching the local news. Dusek: Do you usually watch the local news? Van Dam: I notice if it starts. I go by those channels and I notice. Dusek: Why did you close the door? Van Dam: The dog had no bed, so i knew she’d be roaming the house for somewhere else to sleep, bothering the kids and possibly pee somewhere in the house. She was still a puppy. Dusek: So she was in the room with you? Van Dam: At that time. Dusek: Do you remember if you turned the tv off before you went to bed — fell asleep? Dusek: What’s the next thing that you remember happening? Van Dam: The dog was whimpering i believe around quarter till 2 :00 in the morning. So her whimpering i believe woke me up, and I took her downstairs and I again let her out back and watched her, and then brought her back in, closed the door and went back upstairs. I didn’t close my door this time. I left the door open. Van Dam: Because i knew that Dad’s closed at 2 :00 a.m. So i knew Brenda would be home fairly soon. So i let the dog roam the house because i knew that she’d greet them when they got home. Dusek: Do you know what it was that woke you up? Van Dam: I believe it was the dog whimpering that woke me up but i’m not sure. Dusek: Is there a alarm light — is your house wired for alarm? Van Dam: The house is wired for an alarm. Dusek: Explain the alarm system how it works. Van Dam: The alarm system, we never set the time, and when it’s not set the way it works is there’s a panel and it has green lights among it. when everything’s closed the green lights are on. And then it has a bunch of zones, like maybe eight zones, and the doors and windows are grouped into those eight zones, so a number of doors and windows will be one zone. When any one of those doors is opened the alarm will chirp once. Van Dam: Short chirp, not too loud. I don’t know if it awakened me. I don’t know whether you can hear it with the tv. I know you cannot hear it with the tv up too loud. Dusek: You cannot or you can? Van Dam: You cannot. if your tv’s real quiet you can hear it in your family room. Dusek: How many chirps does it give? Van Dam: I think five chirps, not even four chirps, dee, dee, dee, dee. And after it chirps it doesn’t make any more sound, but a red light flashes for that zone and the red lights keep flashing until the doors are closed. Dusek: And that solves the problem? Van Dam: Right. and if you open another door in that zone it doesn’t make a chirp or anything. Dusek: When you got up at about quarter of 2:00, how certain are you about the time, sir? Van Dam: I’m guessing about a quarter till 2:00, because the only time I was certain is when they got home, and it was a few minutes before they got home. Dusek: And how do you know what time they got home? Van Dam: I recall looking at the clock at that time. Dusek: What time did you see the clock? Van Dam: 1:54, -5 or -6 are the numbers. i believe it’s probably 1:54 when they first came in, and when i looked at it again it was -5 or -6 . Dusek: When you got up at about a quarter to 2 :00, were you aware of whether or not that alarm panel was activated? Dusek: Did you pay attention to it at that time? Dusek: And after you took the dog downstairs and went outside, you came back where? Van Dam: Let her out, came back up to the room, didn’t bring her. I don’t know if she came into the room with me or not, laid back in bed and turned the tv on because i knew they’d be home soon. Dusek: What’s the next thing you remember happening? Van Dam: I heard the truck drive up and i heard them come in the house. Dusek: Is it a truck? Van Dam: It’s an excursion. Dusek: What’s the next thing that you heard or saw? Van Dam: I heard voices. i heard the girls’ voices and i heard male voices also. Dusek: At the time you heard the girls’ voices, did you know who they were? Van Dam: I didn’t know for sure but i assumed it was my wife and her friends. 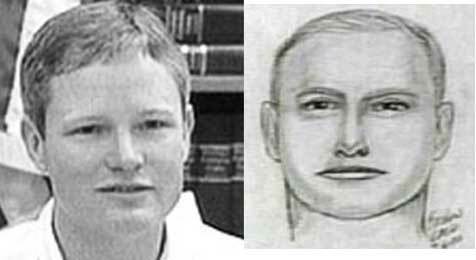 Dusek: and the guys, could you tell who they were? Van Dam: No, i couldn’t. Van Dam: Barbara and Brenda came upstairs. i’m not sure they came upstairs together. I think they did. Came into the room, and Barbara jumped on the bed next to me on top of the blankets, and I think Brenda went in the bathroom but i’m not sure. Laid there with Barbara for a minute, and Brenda went out of the room, went back downstairs, and after a few minutes ago we turned the tv office, snuggled up with her and we talked with her for just a minute, and i started to dose off and Brenda asked us to come down. Dusek: What were you doing with Barbara? Van Dam: Kissed her, snuggled or something. Dusek: did you rub her back or anything like that? Van Dam: I think i put my arm around her and rubbed her back, yes. Dusek: how long would you say you were upstairs with her? Van Dam: five minutes about. Dusek: was she on top of the sheets or underneath the sheets? Van Dam: She was on top of the blankets next to me and I was underneath the blankets. Dusek: do you recall then that Brenda came back up? Van Dam: Brenda came back up and asked us to come downstairs, said it was rude of us to be staying up there while everyone else was downstairs. Dusek: when you reported the situation to law enforcement did you include this part of what happened that evening to law enforcement? Van Dam: not at first. Van Dam: I — it didn’t seem relevant. Van Dam: at first — didn’t seem to matter whether or not Barbara came upstairs or not. Van Dam: still doesn’t seem to matter. Dusek: did they tell you they wanted to know everything that happened that night? Van Dam: when they told me that it was critical that they know absolutely everything that happened that night I told them everything that happened that night. Dusek: when you went downstairs, who all was there, mr. Van Dam? Van Dam: Keith and — and of course Denise, Barbara and Brenda were there, and Keith and Rich were there. Dusek: Do you know rich’s last name? Dusek: how long had you known him? Van Dam: about a year. Dusek: and you knew who Keith was? Van Dam: Keith was his cousin. Dusek: had you met him before? Van Dam: i met him on a few occasions at Rich’s house. Dusek: what was going on downstairs? Van Dam: they were at the kitchen table eating pizza and cookies. someone was heating up some pizza. and they had a thing of chocolate chip cookies out on the table. Van Dam: pizza from noon. Dusek: do you recall what they were drinking? Van Dam: I don’t recall what they were drinking. Van Dam: They may have been but I don’t remember. Dusek: did you have anything to drink? Van Dam: I had a glass of tea. Dusek: how long did they stay there? Van Dam: Ten, 20 minutes max, I can’t be sure. Dusek: how did the group break up? Van Dam: Denise was saying she wanted to go. After a while her and Barbara left. After we said goodbye to them at the front door Brenda and i went back in and talked to Keith and Rich for another few moments and escorted them to the front door and say good night. Dusek: Did they leave the house? Dusek: Did you see them leave the house? Dusek: are you able to estimate for us, mr. Van Dam, about what time it was that these four people left your house? Van Dam: about 2:30, that’s a big about, though. Dusek: did you actually take note of what time it was or is this an approximation? Van Dam: it’s a big approximation. Dusek: are you able to approximate about how long they were at the house? Van Dam: ten to 20 minutes I think . Dusek: anybody smoke any marijuana at that time when all those people were still at the house there at o’clock or so? Van Dam: not that I saw . Dusek: did you see anybody go out in the garage and do anything? Dusek: did you go out in the garage and do anything? Dusek: did you see your wife go out in the garage and do anything? Dusek: after they left what did you do? Van Dam: went back upstairs. this time i took her to Derek’s room. I know she sleeps sometimes on his lower bed, and her tendency is she’s allowed free roam of the house but if she’s around she will go in but confined she won’t. when she doesn’t have a bed in our room she makes noise, and i figure it would be better to let her sleep on that bed. so i put her in Derek’s room. Went in our room, forget whether Brenda was getting ready for bed or already in bed, got in bed with Brenda. Dusek: did you guys go to sleep? Van Dam: went to sleep. Dusek: Are you able to estimate about what time it was when you guys turned the lights off? Van Dam: i’d guess around 2:30. Dusek: And at that time did you think the house was secure? Van Dam: yes, but I don’t recall specifically looking at the alarm pad. Dusek: But when you went to bed that night did you think the house was secure? Dusek: did you think anybody else was in that house besides members of the Van Dam family? Dusek: what was the next thing that you became aware of that evening, mr. Van Dam? Van Dam: sometime after 3:00, 3:15 , 3:30, I don’t know, I recall seeing a “3 ” on the clock. we’ve got a vcr clock in our room that’s in that armoire cabinet. Dusek: by the television set? Van Dam: by the television set on photograph “b” there. Van Dam: exhibit 20, i’m sorry. it’s a small clock, so i can’t really see the numbers that well. I think it was after 3:00. and I don’t know what woke me up. it might have been because I had to pee, might have been a sound. but i noticed when i got up that one of the red lights on the alarm pad by the door of the master bedroom was flashing. Dusek: Do you remember hearing the chirping sound before you saw the light? Dusek: By looking at the pad were you able to determine what area to check from the house? Van Dam: you can but I didn’t. i just went to check. Dusek: So what did you do? Van Dam: went out of our room, downstairs. as soon as i got downstairs, i went towards the kitchen and noticed a cold draft coming into the passage way between the dining room, living room area and the kitchen family room area. Dusek: When you got up from bed do you know whether or not your wife woke up? Dusek: No, she didn’t or no, you don’t know? Van Dam: i do not know. Dusek: Did she acknowledge you in any sort of way or say anything to you? Van Dam: no, she didn’t. Dusek: Did you say anything when you came back to bed eventually? Van Dam: no, not that i recall. Dusek: So as you were heading downstairs towards the rear of the house you noticed this cold air? Van Dam: went to the back door, the sliding glass door, and it was open a crack six to ten inches, something like that. I know it was a small crack, like you could stick your arm through, but not you could walk through it. I don’t think it was wide enough that the dog could go through it either. Dusek: so we know what you’re talking about, let me direct your attention to court’s exhibit , what’s labeled “Van Dam residence kitchen.” do you see the sliding door that you’re talking about? Van Dam: photograph “a” right here, you can see the handle of it in photograph “a”. it’s close to the kitchen table. Dusek: that’s the one that was ajar? Dusek: Do you know if the — where was the dog at that time? Van Dam: in Derek’s room. Van Dam: I don’t remember — I know i — in recalling it over and over, i sometimes thought i would let the dog out at that time, and I don’t think i did now but i’m not sure. Dusek: do you remember if the heater was on as you approached that back door? Van Dam: yeah, the heater was on. Dusek: did you look anywhere else after you got that door closed? Van Dam: — on the alarm panel, which means all the doors are secure. i went into the garage anyway and turned the light on in the garage and looked at the side door to the garage. the locks, when they’re locked are up and down and when they’re open, they’re sideways. so I didn’t actually check the door, but i looked at the door, the lock was in the latched position. Dusek: now, how about the door leading from your house into the garage, is there a locking mechanism on that? Van Dam: there is a locking mechanism on that. it’s key locked and because of smoking cigarettes, cigars and marijuana in the garage, we had turned that lock around on the door so the lock was actually on the outside, not on the inside.